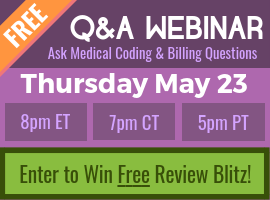 Boyd: Welcome everybody to the Certification Coaching free medical coding webinar for June 2016. This is Boyd, your webmaster here at https://www.cco.us, along with Alicia Scott and Chandra Stephenson. Hello ladies, how are you doing today? Boyd: We’re looking forward to a great webinar once again. We do not have Laureen Jandroep, our CEO and “Head Coding Queen” with us tonight. She’s with family, so we’re doing some pinch hitting for her, but missing her, of course. Let’s send her some greetings; if you guys want to do that, she will certainly get this after the webinar. We want to welcome you wherever you’re calling from. I want to give you a little bit of information about how this webinar works if this is your first time. Number one, this webinar is going to last about 90 minutes. There’s going to be, first of all, an introduction that we’ll go over about five minutes, then we’re going to get into the Q and A from the community, which we have prepared. Tonight, Chandra is going to go over BMI in ICD-10-CM, HIV/AIDS and Opportunistic Infections. Alicia is going to be going over CRC Practice Exam Question, the Risk Adjustment Course Pearl for GERD, and CRC Pre-employment question. Hopefully I got that right for everybody, we haven’t got any last minute change, I think we’re good. Then, at 90 minutes after we go through the questions here that we’ve prepared, we’re going to a wrap-up and then a drawing which I’ll tell you about in a second. Then, for those you who want 1.5 CEUs from this webinar, that’s available and we’ll tell you about that here in a second. Number IV here says: “Your Questions in the Chat.” You have a question box probably in your GoToWebinar control panel, at any time during this evening’s presentation, you can type in a question for us and our chat team behind the scenes will copy that question and figure out, number one, if we can answer it right away, or if we will put it into the chat and answer it about 90 minutes and we’ll do that in the Q & A at the end. Our webinar usually last 2 hours, so by all means put in your questions. We definitely welcome the first time attendees to our CCO webinars and welcome you and thank you for joining us, and we thank everyone for the time that it takes out. It was recently told to me you could buy something for $7 but your hour of your time, two hours of your time is not worth $7, so we really, really appreciate that you take the time with us, and hopefully we can give you some value back. If you don’t get your questions answered tonight, we’ll have hundreds here so don’t be upset if we don’t get to your question right away, or if at all, because we see the questions but we just can’t get to all of them; so by all means post them but just be patient with us. But you can always go to https://www.cco.us/forum and be able to post your questions there for the whole coding community to actually give you some feedback on. Why Stay To The End? I’m going to talk to you about the giveaway that we have at the end. Alicia, tell us about the giveaway, why should people stick around to the end? Alicia: You know CCO likes to give back, not only do we do the webinars, but we want to give you something for staying with us for this long webinar. Way back when we started this, you have a choice if you stay ‘til the end and your name is picked, we have a random drawing program, and you can get either one of our Blitz packages, you could also get an hour session with – it says Laureen or Alicia, but you could also pick Chandra, too. Or CEU packages, we have fabulous number of them; and E/M if you need some help with that or modifiers, you can pick that as well. We hope that that is encouraging you to stay until the end, right at the 90-minute mark, Boyd, that you do that? He’s real good about keeping us on track. Boyd: Yeah. So, stick around for that. The next slide talks about the CEU certificate. As I mentioned at the beginning, this webinar is worth 1.5 CEUs. We changed the system so some of you who might have been gone from our webinars for some time, we used to give this out for free, but because of the cost of doing our webinars and all the things that we put in for the people who joined our Replay Club, we’re nominal fee for those who want to purchase that. This slide actually explains it a little bit better; hopefully when you come to that point in the webinar, when we’re at 90 minutes, you will understand what to do. 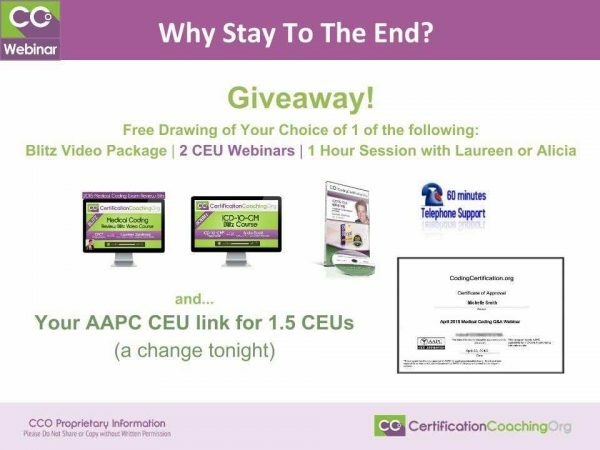 So, basically, if you’re a current Replay Club member, you’ll see that on the left here, it says that basically you can get the CEU certificate for this webinar for free. That’s included with your membership for $19.95 a month. But if you do need 1.5 CEUs from this webinar, you can purchase them for just $5 and that will be available with the $5 one time purchase that will look just like that; so we’ll give you that link for all of this stuff and explain it in more detail at 90 minutes, but just want to give you a heads-up about that and how that works. But this webinars are totally free otherwise. The first poll is that we want to know a little bit about our community who is with us tonight, so we want to find out: Are you certified? 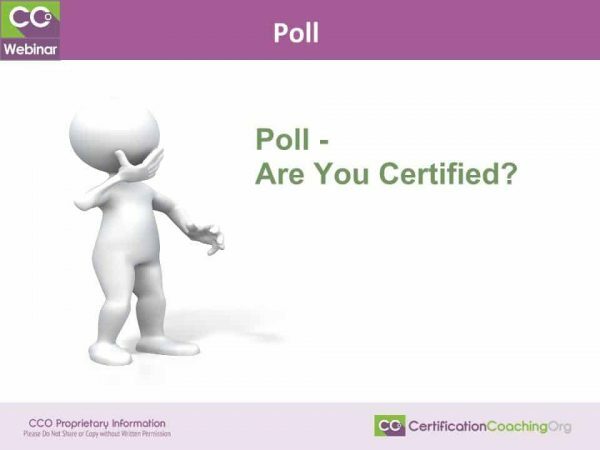 Let’s launch that poll and let us know are you yes, not yet, or are you working on additional certifications? Chandra: Alicia and I fall into that third group. Boyd: Yeah. You never seem to stop there, Chandra, we could have a whole page on your certifications. Chandra: Where would the fun be in stopping? Boyd: I know, totally, right? I’m going to close it in 3, 2, 1, and I’m going to share this, guys. Yes – 65%; not yet – 26%; and 9% are working on additional certifications. Awesome! Boyd: Thanks for sharing that. 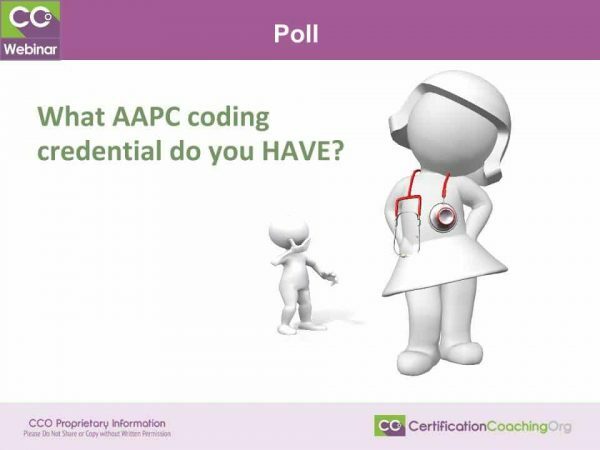 Poll: What AAPC Coding Credential do you HAVE? For those of us who have identified themselves as already having a certification. Chandra, you want to read those of as options, for those of us who are connecting maybe with telephones and things? Chandra: Sure! The first option is the CPC/CCS-P which is about the physician-side credentials. The second are the facility credentials: COC, CIC, and the CCS. The third would be the CPMA, the auditing credential. The fourth is the CRC or the risk adjustment credential. Then, that last option is to indicate you have multiple credentials or something other than what was on the list. Alicia: I’m so glad we got all those lumped together, so it wasn’t just one per… Look at that, how many CPMAs and CRCs we got. Boyd: Yeah, nice. So, I’m going to close it in 3, 2… last chance. Here we go with the results of that one. Boyd: CPC/CCS-P is 77%; COC/CIC/CCS is 9%; CPMA is 3%; 4% for CRC, and multiple/other is 16%. Thanks, guys. Boyd: We’re going to be talking about the CRC.